I've previously established my predilection for cider, so it's no surprise that Kellybrook Winery's annual Cider Festival is set to become an autumn fixture for me. The Festival celebrates not just cider but also the West Country culture, in which cider is a far more refined drink than a monolith like Fosters (who distribute Strongbow) would credit it to be. 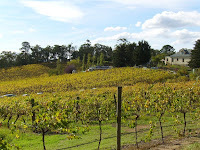 The winery's bucolic setting is the first indication of the pleasures in store. En route from the carpark a demonstration of cider pressing is under way, the crates of apples giving out their sweet scent as they also surrender their juices. The sound of bells joins the aroma of apples in the air, as Morris dancers snack and drink between their own demonstrations. Music plays all day, a magician is on hand, and the usual cellar door offers tastings of Kellybrook's wines, including a champagne cider, riesling, shiraz, pinot and apple brandy. The winery has a restaurant on site and on Festival days there's a clearly worn path from its door to the food tent. The food on offer is limited but fitting: pea and apple soup with sourdough, Boscastle pies, Ploughman's and Squire's sandwiches, and hot chips. 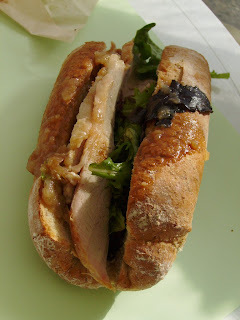 The Squire's lunch is a sourdough roll with pork and apple sauce. 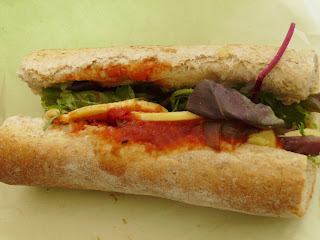 The Ploughman's is also squeezed into a sourdough bun and features a wodge of cheddar, greens and chutney. Bellies sated, it's time to slake one's thirst. The fresh-pressed cider comes a variety of ways: there's mulled, warmed and intensified with the addition of cloves, cinnamon, nutmeg and perhaps some sugar. There's draught or bottled cider, and for those parked on the grounds straight apple juice: $1 for a small glass, $2 for a large. That's a great value vitamin fix. Enormous barrels keep filling four-litre bottles of scrumpy. This is West Country-style cider, traditionally made from late-season apples. Kellybrook's version is still rather than sparkling, and will keep fermenting in the bottle. It's smooth and dry, with a slight ginger bite at the end. When hunger returns, a feast of desserts waits to greet it. 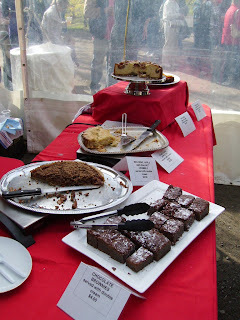 Not all are apple-based: there are brownies, orange-almond cake and fig cake. 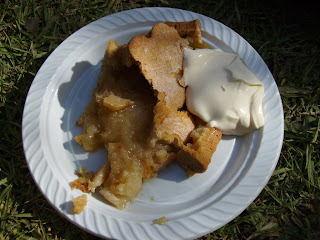 The apple custard sponge and traditional apple pie bring the crowd's attention back to the star of the day, however. All desserts come with cream, which one can lavish on to their heart's content. It's a good analogy for the day really: there's as much decadence and pleasure available as you care to ladle out. I WANT that Squire's lunch!